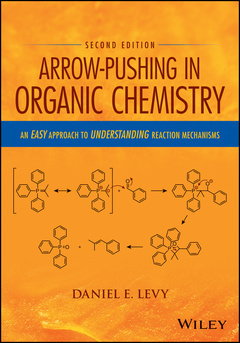 Arrow-Pushing in Organic Chemistry Levy Daniel E.
Add to cart the livre of Levy Daniel E.
"... fills an important gap in undergraduate education, and I would encourage every instructor of organic chemistry to seriously evaluate this text as a substantive aid. This book is definitely well worth its price!" "... serves as a valuable workbook to counteract student memorization and compartmentalization of organic chemistry material. ... a great supplemental resource to guide the novice organic chemistry student down the path to a true understanding of the subject." "The high point of the book is the provision of a large number of carefully targeted problems at the end of each chapter, complete with well–explained worked answers. I am sure that these will be highly useful to students...."
Most organic chemistry texts intimidate through sheer size, encyclopedic presentation of reactions, and a huge amount of material to memorize. Building on the legacy of a highly successful first edition, this book teaches a better and easier way to approach the subject the arrow–pushing strategy that reduces organic chemistry to the study of interactions between organic acids and bases and builds from there. To help the students discouraged by the belief that this topic cannot be mastered without signi cant memorization, the 2nd edition of Arrow–Pushing in Organic Chemistry serves as a handy supplement for understanding the subject. New and updated chapters cover free radicals, carbenes, and pericyclic reaction mechanisms. Additionally, problem sets for each chapter emphasize the important concepts, reinforce the reader′s knowledge of chemistry, and introduce other aspects of organic chemistry discussed in latter chapters or in a student′s class.